Anna Maria Island's City Pier, approximately 30 minutes before sunrise. I have recently returned from a wonderful, relaxing, vacation on Anna Maria Island, Florida, along the Gulf of Mexico. It was nice to take a break from "regular" life. However, I could not be in such a beautiful spot without taking a few photographs. I focused most of my attention on sunrise photos at Anna Maria's City Pier. I woke up early on three different mornings to experience the sunrise at the Pier. There is a period of time shortly before sunrise and shortly after sunset, referred to as the "Blue Hour." At these times the quality of light is often magical for photography as a blue tone is cast across the landscape. The last morning was quite unique. The photo above was taken then and shortly thereafter, I was treated to a special encounter with a Blue Heron. As I was sitting on the bench along the Pier's boardwalk, looking for other possible photographs to take; a Blue Heron landed on the edge of the Pier about 15 feet away from me. My camera was already set up for a 20 second exposure with a wide angle lens, so, I seized the moment and calmly approached this welcomed visitor. I decided to frame up the photo below as I squatted down on the boardwalk with my tripod set up about 8 feet away from the heron. I counted the 20 seconds in my head hoping that he would stay still as the shot was being taken. If he moved at all, he would just be a blur in the frame. He was kind enough to oblige and then quietly flew away a few seconds later. I will always treasure this photo for the unlikely, special moment that this heron gave me. I have had several similar questions regarding one of my most recent images. "Where was that?" 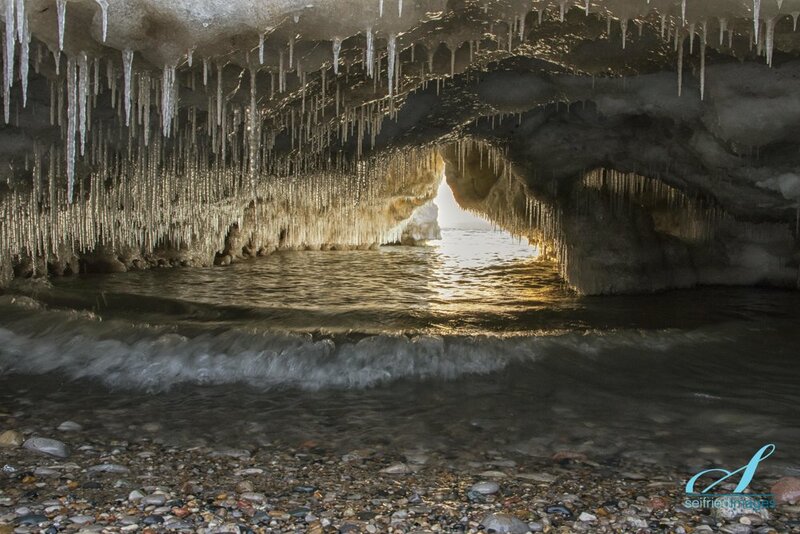 The image titled, Ice Cave Lens Flare, was taken along the shoreline of Lake Huron, in my home town of Bayfield, Ontario. As the weather warms, the Lake thaws and moves about, it starts to undermine the large ice mountains that have formed along the shore. These mountains form when the waves crash in and freeze, building layer upon layer during the early winter. I was walking the beach one afternoon looking for a possible place to take some sunset photos that evening. I noticed a small opening at the base of one of the mountains. I crawled down to check it out and knew that this would be the place that I would return to. Upon returning I climbed into the opening to realize that my tripod couldn't go low enough to set up for the shot at an angle that I liked. 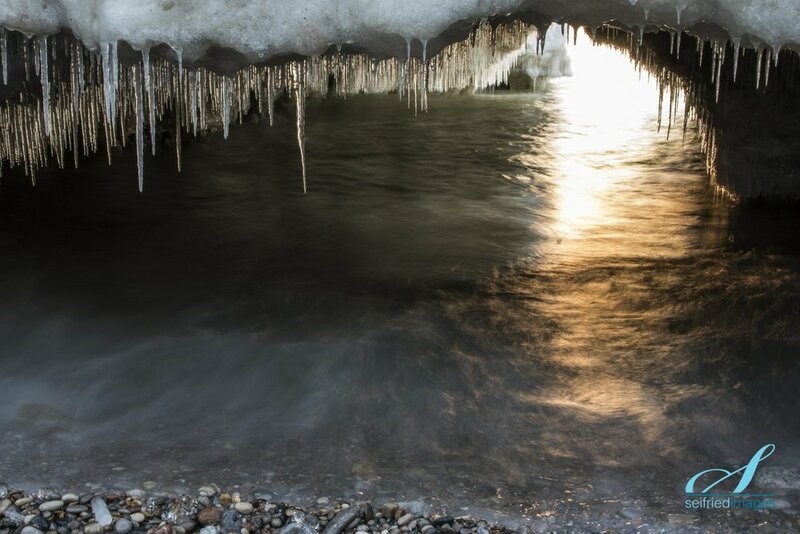 I ended up laying on the beach to be able to shoot through the cave. 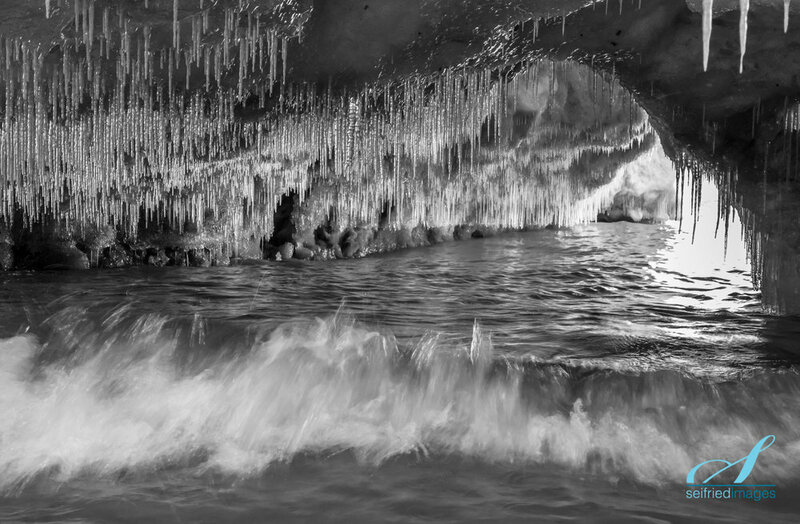 As the sun set, it briefly shone into the cave. I had to use a higher ISO setting of 800, to be able to use the small f22 aperture needed to create the starburst from the sun, while having a fast enough shutter speed to handhold the camera. Shooting directly into the sun also gave me the lens flare that I wanted to achieve. The sun shone for only a few seconds like this before setting below a bank of clouds on the horizon. I was so happy to have witnessed and captured this brief moment. Below are a few other images from that evening. The first one shows a shot from my tripod, not a desirable angle in my opinion. The second image zooms in on the golden glow that occurred just before the sun sank behind the clouds. Some waves were also rolling in that evening. The next two images capture some of that wave action. I had to be careful not to get the lens, camera or myself, splashed too much. Thanks for taking the time to read my behind the scene story. I hope that you also take time to enjoy whatever happy moments come your way today. This page is dedicated to sharing some of my adventures and learning points in photography.